Exclusive! Save $25 on this lens! (From Sigma lens literature) Building on the groundbreaking Sigma Global Vision 18-35mm F1.8 DC HSM Art Lens, the new Sigma 50-100 F1.8 (75-150mm on 35mm format) mid-range zoom lens embodies the same engineering prowess to deliver outstanding prime lens-like results. Factoring in the APS-C image circle of 1.5x, the 50-100mm F1.8 covers three popular short tele prime focal lengths: 85mm, 105mm and 135mm. Like the 18-35mm F1.8, the new 50-100mm F1.8 maintains a constant F1.8 aperture yielding exceptional brightness and resolution throughout the zoom, while simultaneously maintaining focus as the lens is zoomed, a feature videographers will greatly appreciate. Features three FLD (F Low Dispersion) glass elements, one SLD (Special Low Dispersion) glass element, and one high-refractive index, high-dispersion glass element to minimize aberrations. Redesigned and enhanced, the new Hyper Sonic Motor is 30% slimmer and provides fast and accurate AF. Highly durable polycarbonate diaphragm made with fluorine; blades feature carbon feather film offering exceptionally smooth operation even during continuous shooting. The new Sigma 50-100mm F1.8 Art will be available in Canon, Nikon and Sigma mounts. 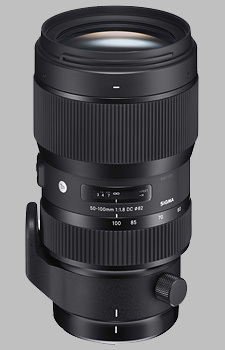 The Sigma 50-100mm f/1.8 DC HSM Art doesn't have any user reviews yet! Be the first to review this lens!